The Whirlwind MEDUSA Standard Series 24-Channel Box to Fan Snake is intended for small or mid-size sound reinforcement applications for stage and performances. The snake features 24 XLR female input connectors on the stage box, and a 200' (60.96m) long cable and fan with XLR male outputs to the mixer. There are 8 XLR returns for monitoring. Belden NEC CM rated multi-pair cable provide heavy duty, flexible, multi-pair cable that withstands heavy touring and rigorous use. 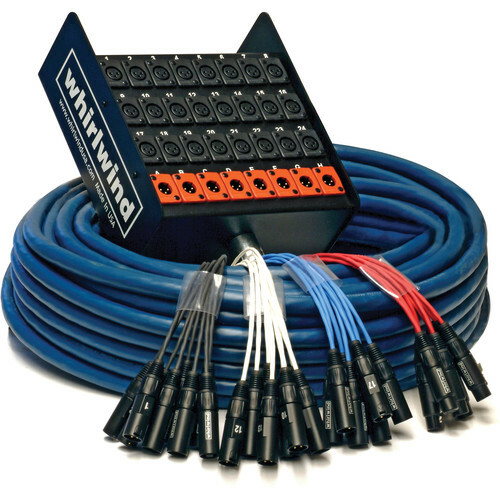 Heavy duty powder coated steel stagebox with Whirlind connectors and integrated handle. Box Dimensions (LxWxH) 24.0 x 23.0 x 15.0"
MEDUSA Standard Series 24-Channel Box to Fan Snake with 8 Returns (200') (60.96m) is rated 5.0 out of 5 by 1. Rated 5 out of 5 by BGHPC from Great snake! Works perfect. It is well made with a large sturdy box. All of the connections are well labeled and 200' works great in our auditorium. Great price for a great product.